Gravy trains invariably come to a halt at some stage in their journey, and labor-driven IT and business services, fueled by lower wage regions and robust delivery models are poised to change beyond all recognition in the next few years. However, this doesn't mean today's winners have to become tomorrow's also-rans, if they are smart enough to make discreet investments in the disruptive business models of the future, and gradually introduce these into their traditional models. You've probably been reading from us that we see several of the Indian majors continuing to carve out a commanding position in the global services market, with their market share doubling in the last four years, in addition to their leading revenue and profit generator, TCS, making the HfS IT Services Top 10 for the first time. And while there are the usual detractors claiming "India will run out of runway and prices are getting too competitive to sustain this growth", they are still able to maintain their growth numbers consistently in the double-digits. 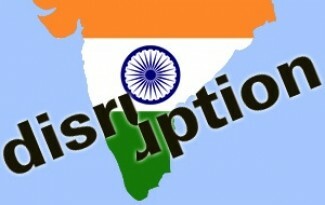 The disruption and havoc the Indian majors have reaped on the incumbent service providers has lasted much longer than many were predicting, and that tail continues to happily wag for them and enterprises continue to gobble up their wares. And with 60% of IT services, and 80% of back office business operations still sitting inhouse, this gravy train has a few more stops left to make on its journey. In short, there are some very real threats to today's entire services model underpinned by one factor: client needs are becoming less labor-intensive and more focused on higher-value business needs. Let's look at six examples of how the new breed of services will emerge. 1) Cloud vendors: Firms like Rackspace, Google and Amazon are already subbing to the major providers to deliver data center solutions for enterprise clients. There is nothing stopping them from moving up the value chain to the client end, displacing the Indian majors altogether as more IT operations become automated and less reliant on human intervention. These firms already have the SME market saturated and can easily move up into the enterprise space once their standardized solutions become "acceptable" at the enterprise level, and less customization is needed. In addition, IBM is making huge bets on selling more cloud-driven platforms to clients, that can replace traditional outsourcing models, which could bear significant fruit for the firm in the future. 2) Robotics-driven vendors: This is more of a threat to current BPO delivery models, where advances in robotic automation software are enabling clients to reduce their "already offshored" services by a further 20-30% by replicating manually operated processes in robotic software solutions. We are seeing this with certain emerging enterprise clients, and some service providers are already piloting robots with clients. As robotics become more mainstream, because of client requirements, those providers with strong ability to replace labor with robotic process automation are going to be at an advantage. This will carve out the bottom layers of many BPO operations and will also change the help desk and IT support functions in ITO as well as BPO. 3) SaaS solutions: Advances in SaaS products often negate the need to outsource entirely, especially where back office processes are becoming dated and obsolete. This is already having a real impact in areas such as accounts payable, payroll, indirect procurement, employee performance management and benefits administration. Specialized solutions such as Concur, Cornerstone, Ultimate and Coupa are already making great strides in these areas, which are not labor-intensive with their delivery. As these current specialists find more ways to integrate together the opportunities for integration services may decline as well. Clients already require software development and API skills in emerging areas like PaaS to support their solutions, with is creating new opportunities for ambitious service providers willing to invest in these capabilitles - and challenges for those persisting with servicing legacy environments. 4) SaaS + services + crowdsourcing: Solutions like LegalZoom in the US provide a lot of self-help managed services that traditionally went to outsourcers, especially in the SME space. There's no reason why these companies can't move up to the large enterprises as clients get better at "servicing themselves." 5) CMO-driven digital services: We estimate 15% of IT deal flow is already being driven from the CMO's office in digital areas that have strong social media requirements, are analytics-driven with a significant mobility requirement. Most of this technology is already available today and the requirements on the service provider are to "digitize" existing business processes. Hence, the winning providers in digital will be those that can develop relationships and delivery teams that can work for CMOs and other business units, not solely IT departments—not a direction in which many Indian majors have oriented their sales and solution teams. 6) "Born in the cloud" clients: Most of the smaller, growing firms today are doing everything in the cloud, and many new capabilities they add are sourced. We would wager that when we look at the Global 2000 firms in 5 years' time, many of them will operate like this. Their needs are going to be very different from the labor-intensive services of today, where clients will expect most operations to be "pay by the drink" and any people-based support will be highly analytical and value-add. The winners in tomorrow's market need to adapt constantly to the developing needs of enterprise clients to stay ahead of the game. The market is going to be hugely different in 3 to 5 years and we are likely to see a new set of providers emerge that can balance the above variables to succeed. But one variable is certain: the use and provision of labor is the one cost on the decline in the services industry, and those providers which fail to recognize this (and some are already guilty) will gradually fade away. What are overarching trends, future directions for business + technology that are sort of representative or visible in these disruptions ? What are the historical shifts and trends, distinctive periods and points wherein the outsourcing sector underwent deep changes. How different is it this time ? What is the fundamental DNA, business philosophy of some providers ? So then what realistic scenarios emerge ? Phil - this is an excellent blog. @Manish: 1) The difference we are seeing it that these changes are being driven from the top-down with a focus on growth and innovation, not bottom-up where the historical focus was in incremental improvement (we have some interesting data to share with you on this shortly). Simply put, CEOs never woke up at night worrying about their accounts payable processes, however, many are increasingly looking at the growth impacts of digital technologies, analytics and cloud - and how they can transform the way their businesses to drive new products/services and go to market more intelligently. CEOs look at the most innovative companies in the world - such as the Amazons and the Googles - and want to know how to be more like them. 2) The first big impact was simply the telecoms revolution, which opened up the use of offshore to develop data intensive services beyond merely voice work. The next was the maturation of the offshore model and the hyper growth of the Indian majors - and the Western providers growing huge offshore presence. The next wave is the quadruple whammy of Cloud platforms + analytics + social media + automation, where the shift moves towards technology-driven solutions, industrialized processes and ability to access much higher quality data is driving down the reliance on labor intensity to deliver and receive services. I agree with the notion that greater market acceptance of Cloud Service offerings by enterprise customers will sideline the traditional IT Outsourcing models and the organizations that flourished for the past 40 years. If the North American based Cloud Service providers are successful, it will repatriate a component of IT support. One of the major signals that Cloud Service offerings have gained hold with Enterprise customers will occur when there is a willingness to abandon the overhead burdened Transition project model that takes months to complete in favour of highly compressed flash cutover project timelines. Thanks much Phil for laying this out so well. You hit the nail. And agree with Alan and Vince that this emerging landscape impacts all providers to varying degree, not just the India HQ firms. And that transition to new models is where enterprise customers are looking for help. You could see a scenario wherein some providers are able to make discreet investments directional in the models of the future and gradually incorporate these alongwith traditional legacy business and hold position with their customers. But that means some will not be able to do this. Keeping the context of 3 -5 years ahead I think many enterprise customers will work to a two speed approach and welcome new niche providers/solution models while incrementally improving/retaining some of the past models and it is unlikely many legacy providers can truly come good on fulfilling strongly on both (think infosys and their products+platforms efforts from 2010 - 2013). So the other scenario wherein a new breed of players emerge is more likely and some of these new providers of BPaaS or even the back office services providers on cloud and a new set of players of the type you describe in your blog. Some have already gained visibility in the enterprise and into Analyst quadrants and some are emerging. At the same time a few of the usual suspects will emerge stronger post this shift. Coming to the vendor landscape. So why is infosys an interesting example...they started much early on the platforms approach to customers (relative), so they now know what hurdles will hit you. You cannot really learn by watching. Another player of potential is TCS, they made an interesting move in the East recently. So which of these firms are usually followers and which are more aggressive? Why did Accenture make those very recent acquisitions? Some people argue that privately held players have a better chance at effectively making the change in their models but that is yet to be proven. Also senior leadership bandwidth to navigate in these interesting times is a determining factor as well and you can see recent trends at some firms. As they say anybody can steer in calm waters it takes different skills to work through uncertainty and in a changing marketplace. Interesting times ahead definitely. ..
Great insights Phil! Thanks for that. A simplistic question that comes to my mind, just as you indicated too, is around the fact that the changes over next few years may well need to be fundamental, than incremental. Interesting thought. However , I think what will drive successful transformation is those vendors who own IP. Rest of the cloud hype is merely virtualization . While Robotics and Cloud can be a fantastic recipe for success, I wonder if M2M (Machine to Machine) technology can take robotics out in the near future? Can someone please help me find the case studies on the implementation of Robotic Process Automation (RPA) in Indian companies?